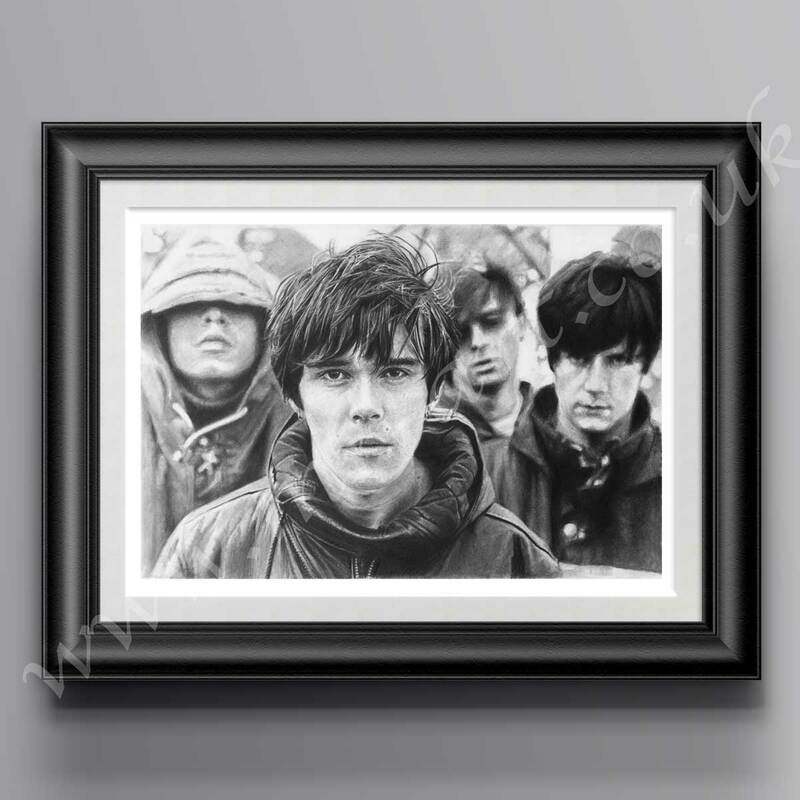 The Stone Roses Made of Stone picture was produced using pencil on smooth cartridge paper and took around 100 hours to complete. Stone Roses are a Northern band from Manchester England. They were the most pioneering groups of there time during the Madchester era In the late 1980s and early 1990s, the band’s most successful lineup consisted of vocalist Ian Brown, guitarist John Squire, bassist Gary “Mani” Mounfield “, and drummer Alan “Reni” Wren a master on the drums. Suddenly tunes like Suger Spun Sister, waterfall, Stone Roses Made of Stone and Adored dominated radio air play, teenagers started growing there hair, wearing baggy t-shirts and sporting 21inch bottomed Joe Bloggs jeans. Already The Stone Roses were showing signs of becoming the most Influential band of all time. On May 27, 1990, on industrial waste land in Widnes, one of the greatest music events of the decade took place. Spike Island it was here that The StoneRoses played to 30.000 sun-kissed fans beneath British blue sky’s. The Stone Roses Made of Stone Ressurection. On 2 December 2011 Ian Brown and John Squire performed together live for the first time since 1995. They joined Mick Jones from The Clash, The Farm and Pete Wylie at the Manchester Ritz in aid of the Justice for Hillsborough campaign. They performed on versions of The Clash’s “Bank robber” and “Armagidion Time” as well as The Stone Roses’ “Elizabeth My Dear”.On 23 May 2012, The Stone Roses held their first public concert since their reunion, playing a 11-song set before 1000 fans at Parr Hall in Warrington. The show, which was only announced that afternoon, was free to attend for those who brought a Stone Roses CD, LP or shirt with them.This was before there best concert ever, Heaton Park.